Dutch artist and environmental designer Daan Roosegaarde has had a rather unusual career to date. He started by studying Art in Enschede and Arnhem before turning to architecture, gaining a Master’s from the renowned Berlage Institute in Rotterdam. 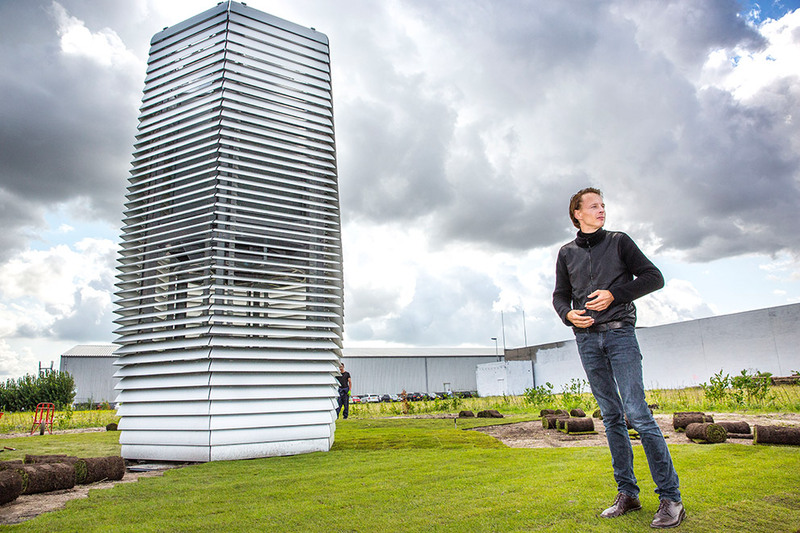 However, instead of then becoming a “classical architect”, in 2007 he opened his own Studio Roosegaarde in Rotterdam with which he has been continuously working on projects along the border between art, architecture, design, fashion and technology. 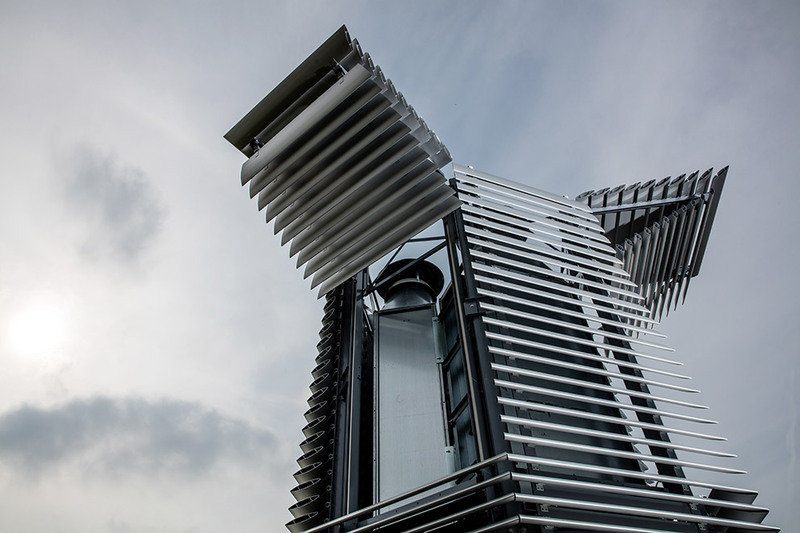 Many of his innovative projects have attracted public interest, but maybe none more so than his latest big project for a “Smog Free Tower” – a tower that is supposed to function like a giant vacuum cleaner and filter all the dust particles out of the air. Paul Andreas spoke to Roosegaarde about the current status of the project, and also about his other current interests. Paul Andreas: Your Smog Free Tower launch last fall caused a stir in the design community. 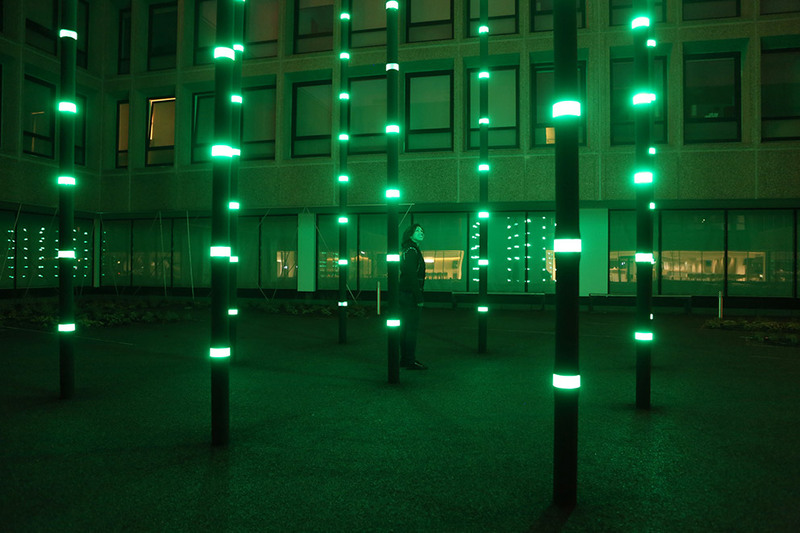 Was it also an artistic shift from lighting installations to another field of research? Daan Roosegaarde: That’s true. Until then we worked a lot with light, but also with energy. At the same time I always thought about my work in terms of umbrellas: An umbrella creates a protected place for people. In a way, the Smog Free Tower is that kind of an umbrella. With the help of electrostatics it removes pollution from the air and allows more sky and light to come through. So even if the tower is mainly about polluted air, it is also still about light. How was your research and development of the tower funded? Daan Roosegaarde: Mainly by crowd-funding. We sold about 1,600 rings to people, each ring will contain all the highly compressed fine dust drawn from about 1,000 cubic meter of air by our prototype of the Smog Free Tower. More financial resources came from the City and the Port of Rotterdam and also our studio. It was really a collective push. What are the next steps of the project? 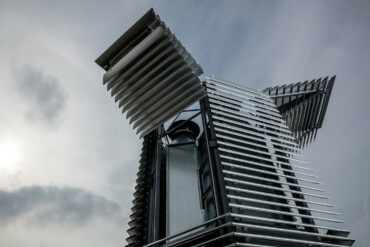 Daan Roosegaarde: My initial experience with the Smog Free Tower was the heavy smog in Beijing. Now we are going to do a “Smog Free Tour” in China, starting in September in Beijing, and travel to four or five other Chinese cities to demonstrate the beauty of clean air. At the same time we are working together with the Chinese government, some NGOs and a pro-bicycle institution. We’ll have talks about what we can do to have an entirely smog-free city. In China such a tower is also a politically sensitive topic: It is high-tech, something new and innovative. It will have to prove first, that it works. You call yourself a “techno-poet”. How does this image of yourself show up in your work? Daan Roosegaarde: My idea is to connect very practical solutions with poetic dreams by using technology that improves our life. It is my conviction that creativity is the biggest asset in today’s world, especially in the Netherlands. Most people live below sea level here. Without creative thinking and technology we would have drowned a long time ago. The whole Dutch landscape is artificial and has this very intrinsic relationship between nature and technology. I see myself in this traditional line, but my question is not so much what we have or what we are, but more what we will be. The installation “Dune” bridges natural grace and technology. 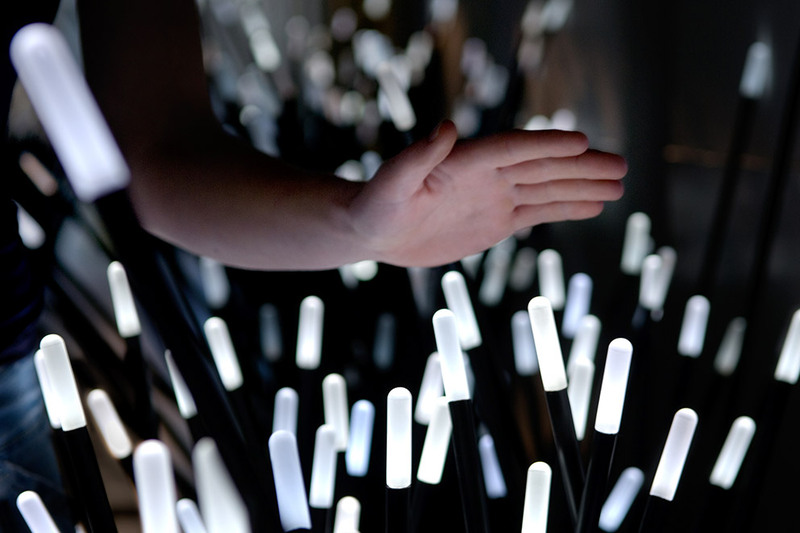 It consists of many “optic fibers” that light up when triggered by the sounds and movements of visitors passing by. You merge nature with high-tech and social behavior to create whole environments which are always very site specific. Why do you favor the spatial experience over the object? 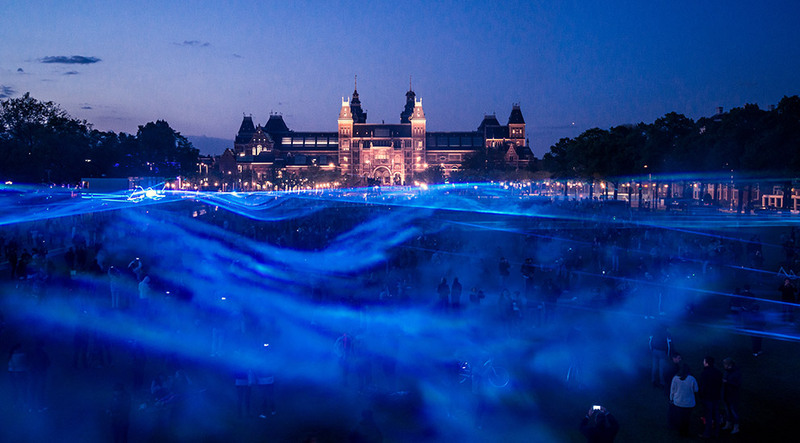 Daan Roosegaarde: I want the things I develop to become part of our new common future reality. To a certain extent we merge realities by taking an existing tunnel or park and giving it a twist and a little update. It is still the old, but a new layer has been added. I don’t believe in any singular objects, I like it when realities are blended and the virtual future becomes a layer of the existing reality. Your Smart Highway project in Brabant seems to me a good example for this layering. Daan Roosegaarde: Most of all, that project was a great, unusual experience as it dealt with our usual roads. Roads are something very ordinary, something everybody uses every day but nobody really thinks about updating them. Every designer is always concerned with cars, but who thinks about the quality of the infrastructure? We cooperated with the large Dutch road building company Heijmans, so we had to be very precise in what we wanted to achieve in terms of energy efficiency and interaction. Finally we also had to go back to the lab to make the existing photoluminescent material they were using for painting the roads more durable and able to emit more light. 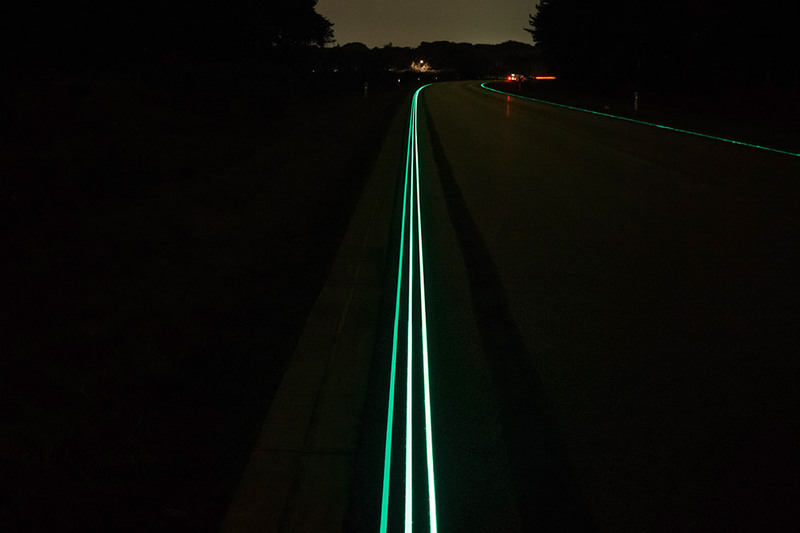 This color creates a cool effect on the road, like the projection of a display. But how does it change your highway driving experience? Daan Roosegaarde: It makes your driving environment more natural and attractive, but also easier. Nowadays you see a lot of disinformation on the roads, the slippery signs for snow and ice during summer and so on. With our new surface that is sensitive to temperature and light, you’re the driving environment gets more interactive: Ice crystals and slippery surface signs are shown on the floor when it’s wet and they start to disappear when the sun is shining. Daan Roosegaarde: That is what we have to discuss. Cars are going to be much smarter in the future, a place where you want to have more personalized information, such as where I am and where I’m going or what I could do during the drive. At the same time the roads need to become smarter too. This is where we have a more collective information: Not everybody can afford a BMW fully equipped with the latest technology. I believe the road has to remain a place of public information for everyone. So in the future you have to think about the balance of private and collective information much more carefully. 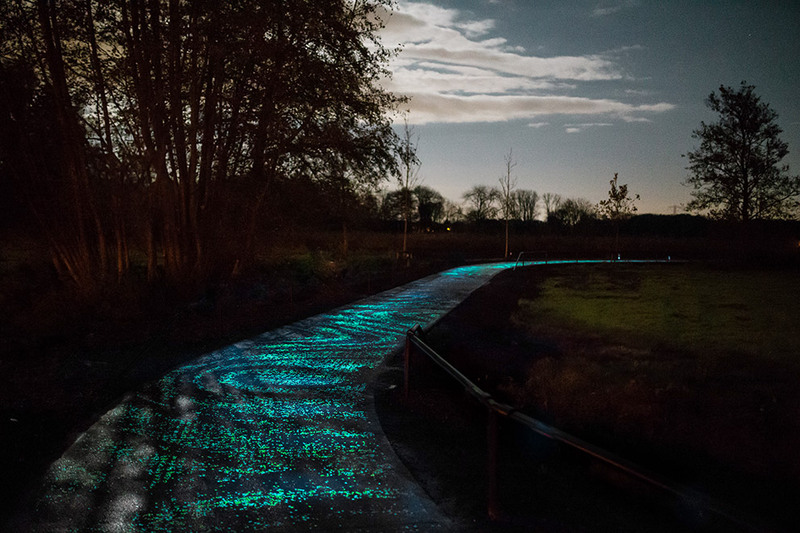 An outcome of your Smart Highway research was also the Van Gogh bicycle path near Eindhoven. In contrast to what most images suggest, the shining stars on the asphalt do not just store daylight, but also rely on an additional black light supply. What made things so complicated? Daan Roosegaarde: When it is sunny for a couple of days in the summer everything is perfectly fine. But when it is cloudy for more than three days, which is certainly not that unusual in the Netherlands, we needed to make it a bit stronger. So we installed this extra lighting on both sides of the path, generated by solar panels to make sure that there is always a certain minimum of lighting. Our next step in this series will be the Afsluitdijk project. The Afsluitdijk is a massive dam stretching over 32 kilometers in the northwest of the Netherlands, it was used to separate a part of the Zuiderzee, the Ijsselmeer. It is an absolute icon of Dutch landscape engineering, and our project is meant to further strengthen the iconic value of this dam. We will add to it a layer of light and interaction, construction work is supposed to start in September and will be completed by the end of 2017. Most of your work is about creating shiny aesthetic icons promoting sustainable ideas. But are the projects themselves sustainable, too? Take your “Waterlicht”: it adds an aesthetic value to green energy, but it also consumes extra energy. Daan Roosegaarde: One of the main questions is, what do we mean by “sustainable”? For me “sustainability” is about feeling connected. It is not about doing less, it is about doing more. The lines of light between the wind wheels in Waterlicht consume about five, maybe six watts. That is almost nothing! We are always very careful with the energy we use in our projects, but most of all we ask: what do we spend the energy on? But even if it doesn’t produce energy like the dancefloor we designed some years ago for the (now closed) Club Watt in Rotterdam, it is about sharing the beauty of green energy. People should accept it more, so that more wind farms can be built and environmentally friendly green energy can speed up. Some projects might be more on the practical side, some more on the poetic. I don’t need to stick to any protocol. I just need to make things which in my opinion have an impact. You have studied at several art schools in the Netherlands, but you graduated at the Berlage Institute as an architect. Have you ever thought about becoming an architect? 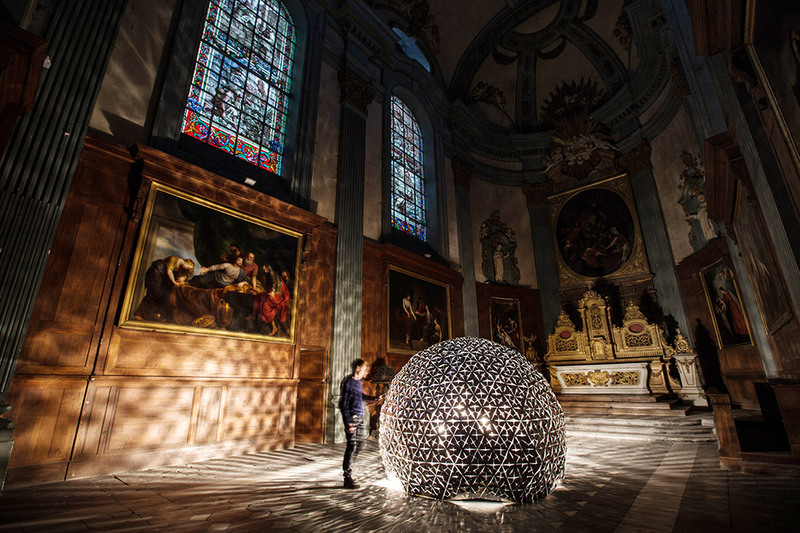 Daan Roosegaarde: I am still obsessed with architecture. Whenever I smell the blue foam in an architecture office I get really excited! I once worked in the office of OMA and I got to know several other great architects like Arata Isozaki. But I felt too trapped just creating buildings for clients, there was no research required. That was the trigger that made me open my own studio soon after graduating. Now we work with architects. They invite us to do a plaza, a façade, etc. We have created our own niche. What about spreading your ideas in the housing industry? Daan Roosegaarde: We would have some ideas, for sure. But we are mainly concerned with public space – the sharable space everybody uses but nobody really cares about. We could do countless artworks for the Happy Few, but I don’t want to do that. In a private setting our work would have so much less of an impact. 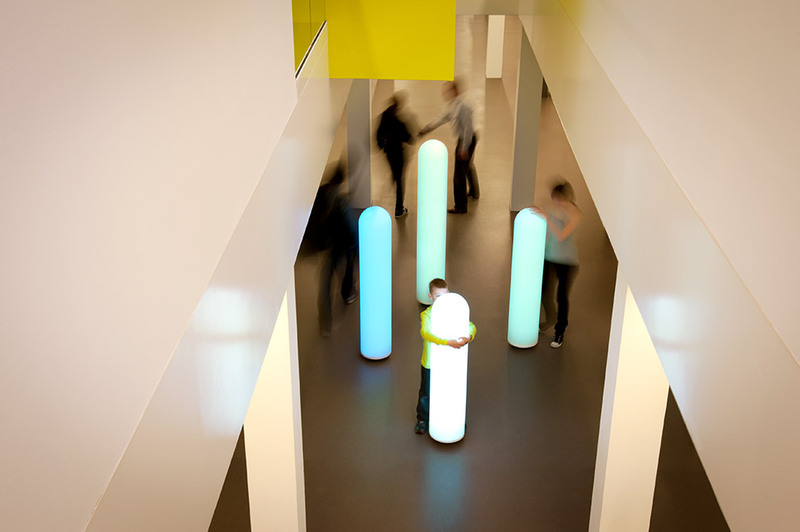 A contribution to psychological healthcare: Entitled “Lunar”, Roosegarde installed a series of interactive light objects in the children’s department of the “GGz” in the Netherlands.